Few works in world literature have inspired so vast an audience, in nations with radically different languages and cultures, as the "Ramayana "and "Mahabharata, " two Sanskrit verse epics written some 2,000 years ago. 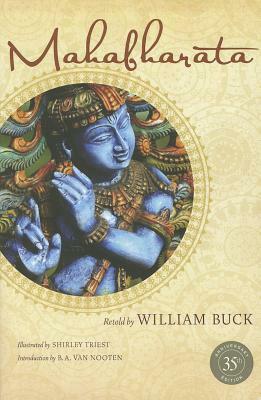 In "Ramayana" (written by a poet known to us as Valmiki), William Buck has retold the story of Prince Rama--with all its nobility of spirit, courtly intrigue, heroic renunciation, fierce battles, and triumph of good over evil--in a length and manner that will make the great Indian epics accessible to the contemporary reader. The same is true for the "Mahabharata"--in its original Sanskrit, probably the longest Indian epic ever composed. It is the story of a dynastic struggle, between the Kurus and Pandavas, for land. In his introduction, Sanskritist B. A. van Nooten notes, "Apart from William Buck's rendition no other English version has] been able to capture the blend of religion and martial spirit that pervades the original epic." Presented accessibly for the general reader without compromising the spirit and lyricism of the originals, William Buck's "Ramayana" and "Mahabharata" capture the essence of the Indian cultural heritage.